From the piers of the Seaport to the blocks around the Broadway T station, big development has transformed swaths of South Boston over the past 10 years. Now it’s Andrew Square’s turn. 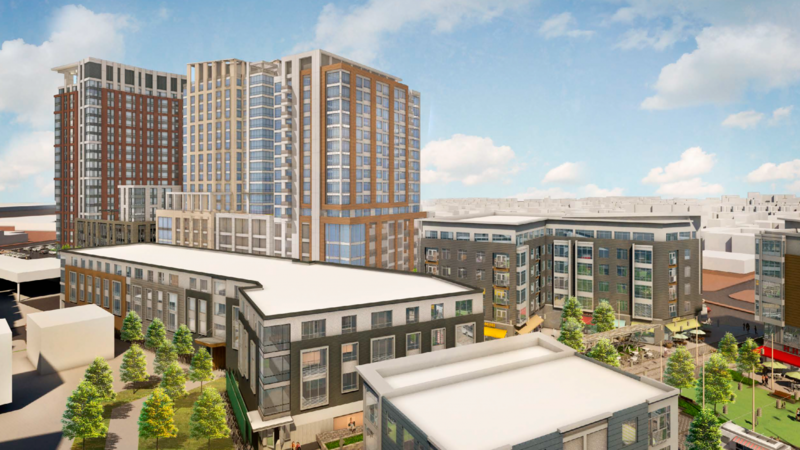 A 5-acre complex of apartments and condominiums between Old Colony and Dorchester avenues is set for a hearing, and likely approval, by the Boston Redevelopment Authority on Thursday. At 656 units, it would be one of the largest new housing developments in the city. And a wave of big projects soon could follow as the BRA rezones Dorchester Avenue. Dubbed Washington Village, the project would turn a sprawling block of low-slung laundries and auto shops into a nine-building complex of condo and apartment buildings reaching as high as 21 stories. They would be set around an open plaza and restaurants, retail, and — the developer hopes — a grocery store. It’s a bid to give Andrew Square the combination of housing and neighborhood amenities it lacks today, developer David Pogorelc said. And it’s a chance to launch large-scale development in a place that has long been overlooked. Andrew Square is at the heart of a planning study the BRA has been working on for a year along Dorchester Avenue in South Boston. The agency issued a draft version in June that would rezone now-industrial blocks north of Andrew for residential and commercial buildings as high as 300 feet. It could bring 6,000 to 8,000 new units of housing along the 144-acre corridor over the next 20 years. A final version of the study is expected later this year, a BRA spokesman said. Already, developers are circling. Two smaller condo and apartment buildings are under construction on Dorchester Avenue, and builders are locking up larger sites. Last month, a machine shop sitting on one-third of an acre sold for $3 million, according to Suffolk County property records. Pogorelc owns a 6-acre empty lot just north of the T station, though he says he has no plans there yet. His plans at Washington Village — especially the restaurants and new retail — are welcome news to Dennis O’Connor, who has lived on nearby Ward Street for a decade. The neighborhood has drawn a lot of new residents in recent years, he said, but there aren’t many places to go or things to do. Big new development can bring those sorts of things, though O’Connor worries the bigger re-zoning, if not handled wisely, could lead to Andrew Square becoming overbuilt. And some say the pace of development is already too fast. In an e-mail to city officials this week, South Boston resident Debbie O’Toole argued the neighborhood has seen too much building as it is. Pogorelc said he’s hoping Washington Village will address that last part, at least. He has agreed to set aside 17 percent of units at prices that are affordable to lower- and middle-income residents, and is aiming the rest at a middle-class clientele that has largely been left out of the current building boom, something he can do, in part, because of the scale of the project. He’s also planning to sell a majority of units — 408 — as condos, a shift from the rental construction that has characterized many big projects of late.